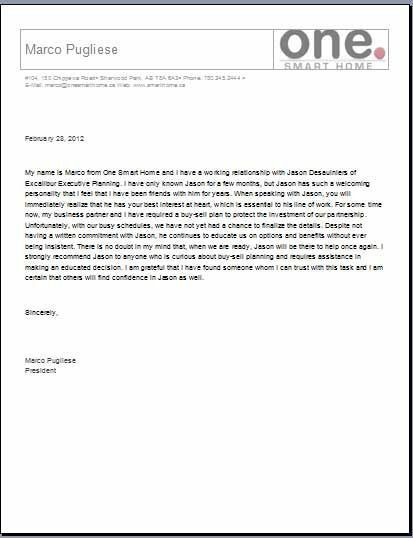 My name is Marco from One Smart Home and I have a working relationship with Jason Desaulniers of Excalibur Executive Planning. I have only known Jason for a few months, but Jason has such a welcoming personality that I feel that I have been friends with him for years. When speaking with Jason, you will immediately realize that he has your best interest at heart, which is essential to his line of work. For some time now, my business partner and I have required a buy-sell plan to protect the investment of our partnership. Unfortunately, with our busy schedules, we have not yet had a chance to finalize the details. Despite not having a written commitment with Jason, he continues to educate us on options and benefits without ever being insistent. There is no doubt in my mind that, when we are ready, Jason will be there to help once again. I strongly recommend Jason to anyone who is curious about buy-sell planning and requires assistance in making an educated decision. I am grateful that I have found someone whom I can trust with this task and I am certain that others will find confidence in Jason as well.